Home » Philately » Registered Letter to Hapag LLoyd Travel Agency Munich. Registered Letter to Hapag LLoyd Travel Agency Munich. 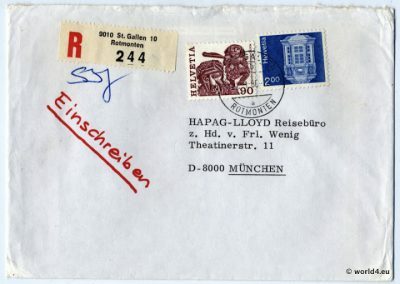 Registered Letter from Switzerland to Hapag LLoyd Travel Agency, Munich, 1980. Collectible Cover, Stamps and Postmark. Next PostBarber scissors manufactured by Veit Germany.